Eight of us had gathered in southern Death Valley over the MLK weekend to tackle some neglected summits that had been simmering on my todo list over the past few years. With more than 1,400ft of prominence, Sugarloaf was the highlight of the day, a long undertaking by the shortest approach even with a highly capable vehicle. We were camped at the junction of Badwater Rd and West Side Rd, about half a mile east of the Amargosa River, whose waters had stopped us from camping further west. We were ready to head out by 7a which coincided with sunrise on the Panamint Range to the west, piling into two vehicles for the hour-long drive to our TH. The first highlight of the drive comes at the beginning where we needed to ford the river - exciting, but easily managed with high-clearance and 4WD. We then drove about three miles of West Side Rd before turning west to drive seven miles up Warm Spring Canyon. The last leg of our drive forks south towards some old mines and Anvil Spring Canyon. The road becomes quite rough for the last section which featured the second driving highlight. A road not shown on the topo map continues from the mine area up and over a minor ridge before dropping down into Anvil Spring Canyon. This last part was too rough for Matt's Subaru, so we abandoned it at the start to make a clown car of Tom's Jeep, driving with five inside, Matt and myself hanging onto the sides and Karl deciding it was nonsense and walking alongside. There were a few boulders to remove and several to be carefully driven around. The road, as it was, had considerably deteriorated over the years and required much care. It probably would have been almost as fast to have walked from Matt's car but it was a fun bit of silliness that worked, getting us to Anvil Spring Wash by 8:20a. From there we had about 6.5mi and almost 4,000ft of gain to reach Sugarloaf. Most of our route was up the south fork of Anvil Spring Canyon, heading southwest for more than four miles. It made for pleasant, easy walking for much of it. We found some desert gourds at several locations, an odd find that we selectively tasted, juggled or smashed, not for our own amusement but rather for the advancement of science. Towards the end of our journey up the wash, it began to narrow, growing modestly brushy for a short while at a place called Lost Spring. We lost Laura somewhere before this (not actually lost - she decided to take her time as she had no intention of going to the summit), and not long after we started climbing out of the canyon and onto the long North Ridge, Nga turned back as well. The rock quality in the area was poor, mostly loose and frankly not the sort of stuff that makes for fun scrambling. Our reduced party of six continued along the undulating ridgeline with several false summits for an hour and a half over class 2 terrain, getting us to the top around noon. We found a benchmark, an old park boundary sign and a Wes Shelberg register almost 40yrs old. There were fifteen pages of entries, surprisingly popular for a non-DPS summit. About half of the names were from the usual suspects, the rest comprised of more random visitors. Shane Smith had visted in 2011, 20yrs after his father had left his business card. The views were quite impressive, looking 5,000ft down to the Amargosa River in Death Valley to the east and 6,000ft up to Telescope Peak to the northwest. All around us were a colorful display of desert ranges that seem to go on and on forever. To ward off the cold and wind about the summit we sought refuge on the leeward side where the sun could warm us more readily. We spent probably 20min about the summit area before packing up to head down. Peak 4,183ft, a P900, lies about 2.4mi due north of Sugarloaf and was our next destination. 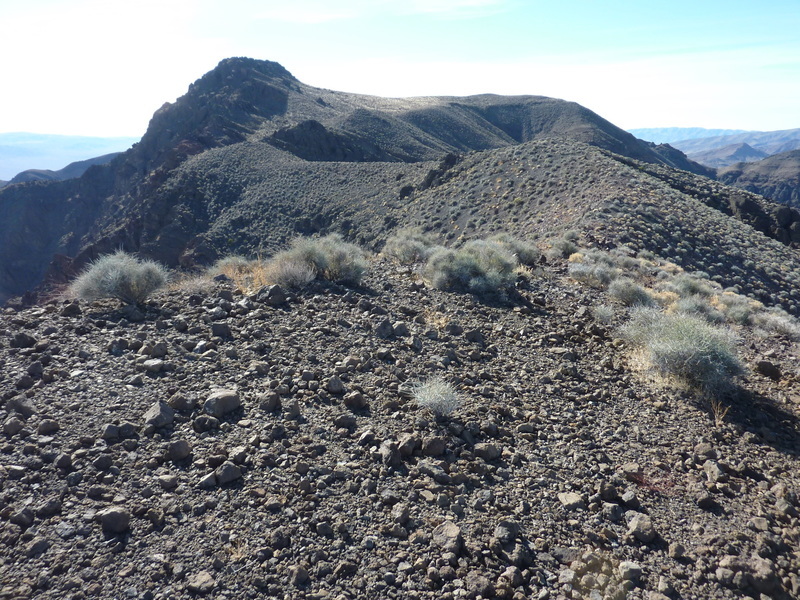 From the summit of Sugarloaf, it appears one can follow a zigzagging series of canyons and washes to reach the SW Ridge of Peak 4,183ft, and it was this route that we initially followed down from Sugarloaf. There was some fun scrambling to be had in the various branches of the gullies we followed, nothing harder than class 3 and some of that not really necessary as easier alternatives were found. There was some tunneling moves, dry waterfalls and more fun as we spent almost two hours on the descent. The plan for the SW Ridge was modified as we were descending, primarily with Tom's preference for continuing down to our original wash rather than ascending back up and over a saddle to the northwest. I suspected Tom's route might be a longer way to reach the SW Ridge, but it didn't seem like it would make a big difference. When we reached the main wash between the two peaks, we had a good view of Peak 4,183ft's South Face which looked imposing and dangerously loose for a large group. Matt pointed out a possible route up this face that I had initially disregarded in favor of the SW Ridge, and after some discussion it seemed that it might make for a far more direct way to the summit. We decided to head up that way, minus Matthew who chose to head back down the canyon to join Laura and Nga back at the Jeep. Matt's route worked out quite nicely, though much of the steep slope was the same poor quality we'd found on Sugarloaf. It was fairly quick, however, taking us only about 40min to reach the summit after starting up from the wash. We had only a few hours of daylight remaining and this probably saved us at least half an hour over the SW Ridge route. I was the first to the summit just after 3p, the others joining me within 10min. We found a register Bob Sumner had left here in 2011, with Sue & Vic Henney the only other party to visit since. Knowing it would be near dark before we returned, we stayed only about 10min before heading down. We had multiple options for the return since any descent line would lead down to either the north or south fork of Anvil Spring Wash, both of which led to the Jeep. I led us down the east side initially, but soon turning north to follow a long class 2 ridgeline down to the north fork. We had one section of class 3 down a dry waterfall (completely unnecessary, too) near the bottom before eventually reaching easy ground in the wash by 4:20p. It would take another hour to make our way back to the Jeep where we found the others inside, warding off the chill that took over once the sun went down. Iris was the only one of the group to resort to a headlamp for which she was docked significant points upon her return. For shame. Headlamps should only be used if absolutely necessary and then only after someone has incurred some sort of injury. Hopefully this is the last time she makes this beginner mistake.